Using authentication via Single Sign-On (SSO) has many advantages over simple Username/Password mechanisms. Whereas for the latter, the user has to remember multiple different Username/Password combinations, this overhead can be significantly reduced with SSO. Also, the security of Username/Password relies solely on the strength of the password provided by the user, but SSO allows for the adoption of several technical measures to further enhance the security of the login procedure. Service Provider (SP): Controls the resources accessed by the User. Identity Provider (IdP): Manages the authentication of different users and generates authentication tokens for the SPs. Users do not have to remember multiple Username/Password combinations. Security policies regarding the authentication, e.g. forcing the user to select a different password every four weeks, can be easily applied. The user only has to change one single password – the password on the IdP. Enforcement of further authentication mechanisms, e.g. Two-Factor authentication, can be applied, without having to modify any of the SPs. By this means, the implementation and integration costs of new authentication mechanisms can be reduced significantly. Privacy: The IdP can record the activities of the users and create profiles. Availability: The IdP is a Single-Point-Of-Failure component in the SSO scheme. If it is not available the authentication on the SPs and the usage of their services is not possible. Security: If the IdP is insecurely implemented and attacks can be successfully started, the security of the entire infrastructure is at risk. The protocol flow includes two phases: Trust establishment and Authentication flow. Cert_SP/IdP: Key material, e.g.. Certificates, which will be used to verify the digital signature(s) in the SSO messages. 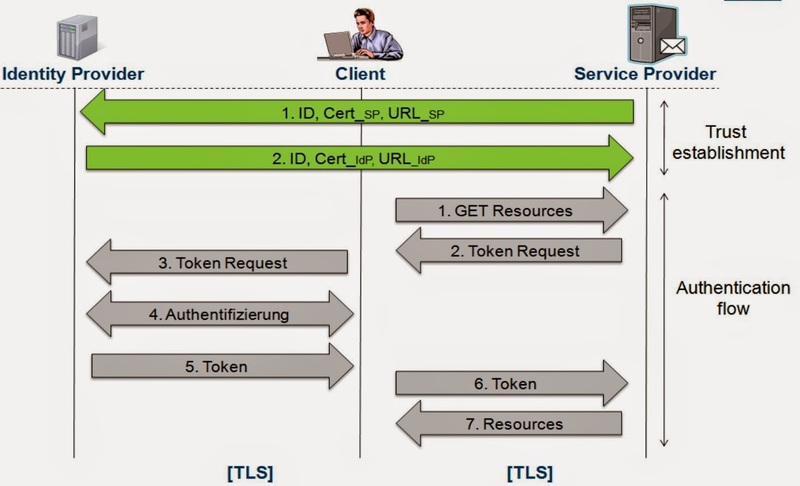 URL_SP/IdP: The endpoints of the SSO interface. All SSO related messages will be sent to this URL. During the Authentication flow the user will be authenticated on the IdP and afterwards on the SP. Step 1: The user navigates his browser to a SP and requests some resources. Step 2: Since the user is not authenticated yet, the SP generates a Token Request. Step 3: The user will be forwarded together with the Token Request to the IdP. Step 4: The user will be authenticated. The authentication can be done via Username/Password or other authentication mechanisms, e.g. Two-factor authentication. If the user is already authenticated on the IdP, this step will be skipped. Step 5: After the successful authentication of the user, the authentication token will be generated. Step 6: The token will be sent through the user's browser to the SP. Afterwards, it will be verified. Step 7: If the token is valid, the SP grants access to the restricted resources. The Security Assertion Markup Languange (SAML) is one of the most used standards for Identity Management. SAML is based on the eXtensible Markup Language (XML) and enables the secure exchange of XML-based authentication and authorization messages. In conjunction with SSO systems, SAML especially offers a standardized format for authentication tokens. In the following section we will explain the structure of the SAML messages and their role in the SSO authentication scheme. The Token Request is sent by the SP to the IdP in order to trigger the user's authentication. The Token Request usually does not contain any sensitive information and thus is not protected by a signature. ID: A nonce, which guarantees that the Token Request is freshly generated. AssertionConsumerServiceURL: A URL pointing to the SAML interface of the SP, where the IdP sends the authentication token. Issuer: The identity of the SP. The SAML Token is generated by the IdP and sent to the SP through the user's browser. The structure of the token as well as the relevant parameters will be discussed in this section. The Response-element is the root-element of every authentication token. It can be digitally signed. By this means, the entire authentication token will be protected by the digital signature. However, this feature is rarely used. InResponseTo: An optional parameter containing the ID of the Token Request received by the IdP. By this means, the SP can assign the received token to the sent request. Issuer: The identity of the IdP. Please note, that all these values are not protected by the signature. Thus, they can be easily manipulated. Timestamps - Every authentication token contains time limitations according its validity. Information about the issuer (the IdP). The value is usually identical with the Issuer in the Response. In this case the URI-attribute in the Reference-element points to the Assertion with ID "_a30d534...da5d".